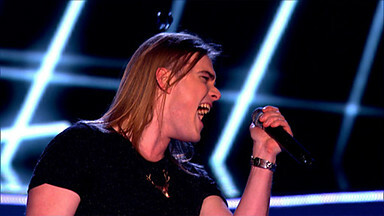 Mitchel Emms is a contestant on the 2013 series of The Voice UK. Team Danny; Age	19; Hometown Stafford; Favourite Voice Kurt Cobain. ﻿Mitchel Emms is a self taught singer and multi instrumentalist, able to play guitar, bass, drums and piano. With his dad as his own personal roadie Mitchel has played gigs up and down the country and headlined a festival in Turkey playing to over 3,000 people! Describing his stage presence Mitchel says he becomes a completely different person and goes crazy – he relishes playing in front of big crowds. Having been part of a band for the last three years, Mitchel is now ready to go solo and let loose on The Voice stage! Everyone take cover.